Is your USB Flash disk ever been infected by a virus and the result is all you files and folder are gone? But wait when went to the technical support personnel in you workplace they says that it is not gone all your files and folder are still there. Feeling confused, you may say but when i check my USB flash drive i cannot see all my files and folder? But if did a deeper probe, by checking the properties of your USB flash drive, you can see that it indicates that your USB flash drive is half full or almost full depending on how many files it contains before the virus infection. Still confuse, well do not be. Here is what happens, when your flash drive got infected by the virus, it hides all your files and folder and then creates a copy of itself. But that copy of itself is not going to look like a virus, it will look like a regular folder inside your flash drive. The moment you click it, it will even more infect all the other files and folder in your flash drive. 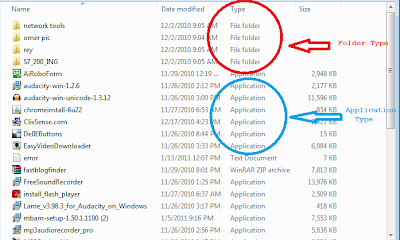 Ever seen a folder that when you tried to open it via the double click method, it did not open instead nothing happen, there is no reaction from the folder. A closer will reveal that it is not really a folder it is an application. Take a closer look at the screenshot below. You can see that a folder is identified as folder and an application is identified as an application in a non-infected drive. To get this kind of view, please select the detail option when displaying the content of your flash drive. Now after the infection happened. All your folder and files is hidden not deleted or erased. 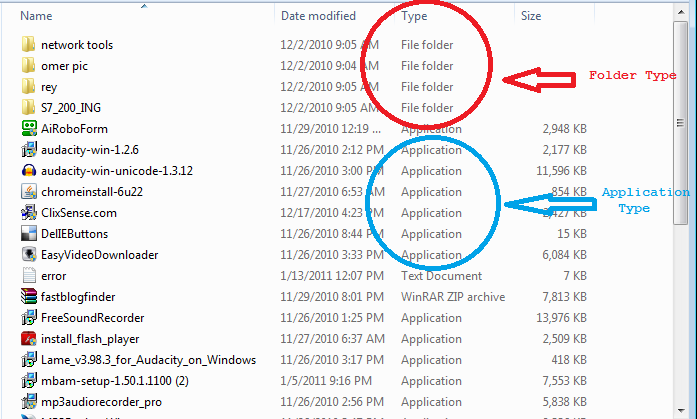 You are left with an application that looks like a folder, but when you view it like this you can see that the folder has been classified as an application. When you see a folder that has been classified as an application then definitely it is a virus. Have your flash drive scan immediately to avoid the virus from infecting other places in your flash drive or drive or any type of container. DO NOT click or double click it. Now how do you recover your files if it has been hidden after a virus infection? Well first make sure that you have scanned and cleaned your flash drive. Next attach it to a clean computer, a computer that has not been infected by the same virus. After is has been recognized by the computer. Follow this step very carefully. First look for a utility or program called FOLDER OPTION. The FOLDER OPTION has three tabs they are the GENERAL, VIEW and SEARCH. Please see the screen shot below. From the screen shot above the three tabs can be seen. The next step selects the VIEW tab. Please see screen shot below. This is where you're going to make the hidden files from your flash drive visible again. For the nest step please select the Show Hidden files, folders and rive option and unchecked all the check boxes for the three following option. The Hide empty drives in the computer, Hide extension for known file types and Hide protected operating system files then clicks the OK button. But wait before you go any further a word of caution, make sure to go directly to the flash drive and do not do to the main hard drive which contains the system files. The system files are hidden by default to protect against accidental erasure. Now that you un-hide it, it is now very open for such an accident. Whatever you do, go directly to the flash drive to get all your files. Now that we have cleared that the next step is to proceed to your flash drive and view it again. After editing the folder option, you can now see your folder. They are now safe to open via the double click. Do not copy the folder because they will be invisible after you redo the folder option. 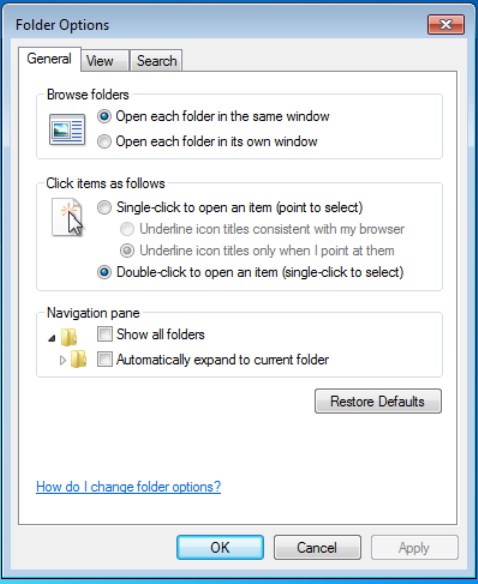 Open the entire folder individually and move all the files inside them to a newly created folder and all your folder will accessible to your once again. Now after recovering your files from the entire affected folder. The entire affected folder can now be deleted from your flash drive. 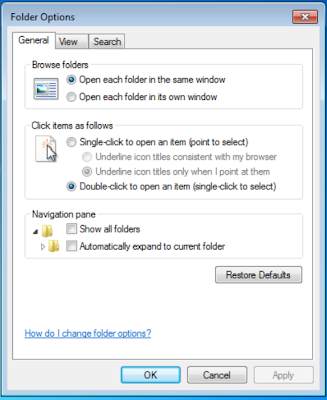 Now for the last part go back to the FOLDER OPTION and put the check mark on all the boxes that you have unchecked earlier and select the other option to return all folder to their normal state. 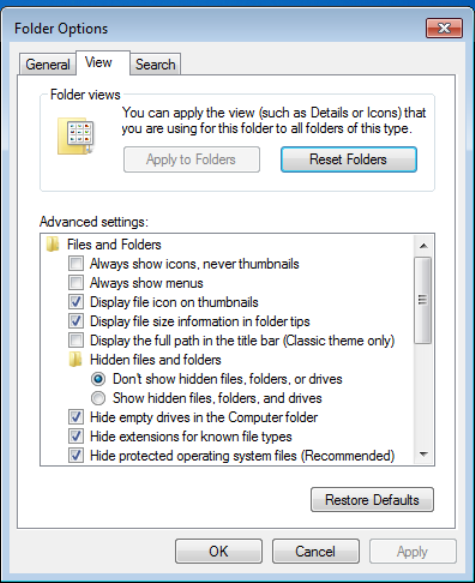 All system files must be hidden the same as before and press the OK button and close the FOLDER OPTION. Remember when ever a virus has infected your flash drive. It will try to fool you by making you think that all your files have been deleted. Do not be fooled by this kind of virus infection. Make sure that you scan your flash drive and have the virus removed and make a deeper probe to see if all your files is still there. Do not format the flash drive as soon as you see that it appears to empty. Remember you smarter than any virus. Computer 101: Keeping your Computer Safe from Viruses and Other Threats. People get sick, the most common sickness is the common cold and it’s relative running noise, flu and head-ache. We get sick because we caught the virus that causes this sickness from other people in our home, work and other places where there are sick people. But this sickness is not life threatening except maybe for a few who has complication from this sickness. But this common sickness can be treated by much home based medicine or at least get our body to use its natural ability to fight off this viruses. Some just need to rest and drink a lot of water to let the body heal itself. Still others buy medicine for this type of sickness especially if the young one or children is sick. These viruses spread themselves thru air or sharing of things with the sick person. Well there is another kind of virus that is not dangerous to people but is very deadly to the things people use like the computer and its entire relative. Ever since the computer was invented and created, viruses have been one of the main threat to its healthy and useful existence. Just like the original organic virus to which it was pattern by its early creator, this viruses has already change from just being annoying to become a real threat to all computer devices. It has already metamorphosis to several different kinds to Trojan Horses, Malware, Adware, Spyware and other type which attack different type of files in our computer. I don’t need to get into the detail of what they do inside your computer. Where going to focus on the basic of keeping your computer devices free of these dangerous programs. Well how does a computer get infected by these viruses? Well first of all there’s the internet, it one of the main source of computer infection and chances are your computer is online for most of the time, then the percentage of getting infected by these virus and its cousin is very high. In this age and time, people can no longer afford not to use the internet so the viruses have become very abundant. Okay now how do you protect your computer from being infected by this malicious and dangerous program from the internet? Well the common ways of protecting yourself is to use an anti-virus. This anti-virus is a program that detects the virus before it can infect or spread itself inside your computer. There are free type and paid type of anti-virus out here. Use any one of them or better yet use two if you know how to configure each so that they will both work in harmony not getting in the way of another. The most common way is installing one of these programs to keep an eye on your computer while you work. Now that’s done you have an anti-virus installed in my computer, my computer is safe now. I can surf to all of my heart content. Woo hold on there, your computer not totally secure yet from viruses and its cousin. You just can go to any website or location on the internet because even if you have anti-virus chances are it will not be enough to combat viruses if you keep going to the those site which has a lot of viruses or contain viruses and other deadly program whose intentions is just to destroy your files and computer. Yes folks this site is really and they don’t offer anything but virus and its cousin. So need to practice safe browsing and downloading habit to help make your computer safe from all type of viruses. I still remember the experiment that i did way back then. The experiment was i used a computer where only the Operating system and anti-virus programs is installed only. I updated the virus definition of the anti-virus and make sure every thing is working as they should be. Then after this i connect that computer to the internet and surf away. I jump from site to another click on all kinds of links that lead from site to another and then when i thought that it was okay and my computer is still working and the anti-virus is doing its job from getting my computer infected, WHAMMM i run onto a brick wall or website that is full of viruses that the moment my computer made contact, they overwhelm my anti-virus and the computer has stop working. It has been paralyzed by the viruses that attack it. The good news is this is just an experiment. Well i quickly reformatted my hard drive not once but twice and have it scanned by an antivirus software just to make nothing is left from my previous encounter. The result of my experiment clearly shows that even with an anti-virus installed on your computer. You still need to practice safe browsing technique while connected to the internet. More on my next post. Computer 101: The Danger of Static Electricity to your computer. Have you heard of the words Static Electricity? Okay, maybe yes or maybe no, not clear? static electricity is not dangerous to humans or people like us but it is dangerous to the internal component of your computer, especially does inside your system unit, the motherboard, hard drive, memory and all those electronic component that you see inside when you open your computer casing. Now where do we get this static electricity? You'll probably surprise that it's fairly simple to acquire or build -up your bodies static electricity. Our body has always static electricity in very small amount of charge. Building them up also is very simple, by just walking in or on object like carpet or electrical charge object we can build up our static charge. The discharge process is also simple just touch a metal object connected to the ground and the static electricity is gone from your body, well not of all of it. Now it is not dangerous to people like us, but this static electricity is very dangerous to the component inside your computer or electronic devices. Do not try touching the inner working of your computer if you feel that you have not touch a metal object connected to the ground. A simple precaution not to damage the inner parts of your computer is Do Not Open the Computer Case Unless you have a very valid reason to do so. One simple discharge from your body to that component that you touch on the inside of your computer and that component is toast. Electronic component is very susceptible to static electricity. They are made of microscopic circuit that small amount of static electricity can really destroy or damage that electronic component. But if you cannot avoid opening and touching the inner parts of your computer, try to keep in mind to first touch a metal object that is connected to the ground to discharge the static electricity stored in your body, at-least try to minimize the damage that you can do to your computers's inner working. Since the entire component inside your computer is made up of micro circuit, meaning they cannot be seen by the naked eye. You need a special device to see this circuit inside those complex integrated circuit found on every computer motherboard. Oops did I mention integrated circuit. IC is the short term for them they looked like a square or rectangular piece of black colours things that is attached to every motherboard. Also they have a lot of metal feet connected to their side. They are called pins and they are use to connect the micro circuit in every one of them to the main system and to each other. Each pin is also numbered according to their design. Take a look at every IC inside you computer they are small right. But on every IC contains thousand of component that forms that micro circuit. They are very-very small. How can a static electricity affect damage or destroy those micro circuit and component? Let’s put it this way, the micro circuit is the big city or town and the component on those micro circuit is the building and houses. Therefore you got a picture of a highly dense city or town. Also the static electricity is represented as the biggest and strongest storm which is depending on the charge of the static electricity. If you put them together guess what will happen. The city or town will be in ruin, there will chaos and all sort of things. All basic services will cease to function. We have seen this scenario played out in our present day. And since the static electricity has damage the inner working of your computer, then it will no longer function properly or if the damage is worst then it the end game for your computer. A word of precaution, whatever you do, leave the inside parts of your to the professional.